Girls, Hate A Guy or Hate Your Husband? 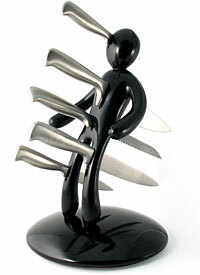 If you hate your guy or your husband, Voodoo Knife Display (The Ex Human Knife Block) is the perfect gift for him, where he will feel that you’re ready and steady to chop. The hate and revenge releaser also available in red and apple color. Name and dedicate the effigy to whomever you please and you’re ready to take out your frustrations as you store your knives! 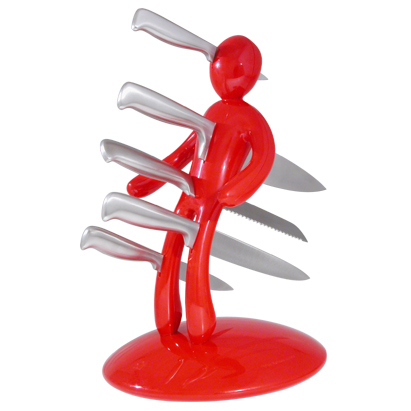 It’s actually a voodoo display with 5 kitchen knives or The Ex 5pc stainless steel knife holder, an whimsical, artistic kitchen accessory. Available in US and UK. This entry was posted on Tuesday, September 5th, 2006 at 12:41 pm	and is filed under Funny Junk. You can leave a response, or trackback from your own site.